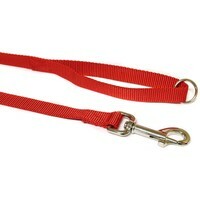 Canac Nylon Dog Lead (Red) is a strong and durable lead made using tough Nylon material with secure edge technology to avoid fraying. Designed with a softweave design for comfort, the leads joints have been cross-stitched for additional strength. The easy release die cast trigger hook has been made out of zinc, which is a strong, reliable and long lasting material.